Once upon a time, there were two warring kingdoms, battling and skirmishing since the beginning of time. One of the kings,despairs at having no male heir – only daughters – Katherine the Wise, Caroline the Beautiful and the youngest, Fantaghiro, a spirited little tomboy. Unlike her sisters who are passive and homebodies, Fantaghiro is active, enterprising and courageous. While her sisters practiced cooking and sewing, she secretly practiced fencing and archery. While they mastered painting and music, she secretly conquered disputations and witticism. She is not only beautiful and nice, but also strong, brave and clever. Disguised as a knight and with guidance from her mentor, the white Witch, she meets the challenge set by the opposing king, a handsome and wise youth who is instantly infatuated with this very suspicious “knight”: Fantaghiro the Beautiful, eyes so black and voice so low she’s a maiden: I know, I know!. 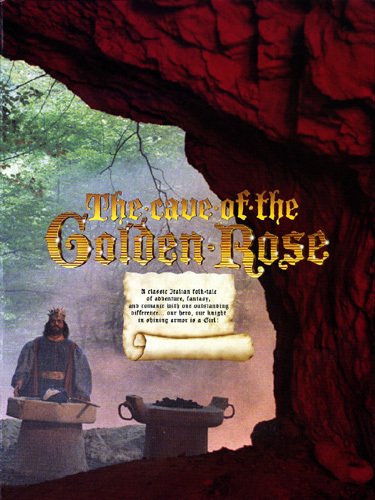 The challenge is to enter the Cave of the Golden Rose, which harbors a terrible beast. Legend says the Sacred Best guards the Golden Rose. If a man enters, he will be thrown out. If a woman enters, she will be eaten.... the prophecy being that the Sacred best will one day be killed by woman. Fantaghiro alone must save her father’s kingdom, by using her natural talents to outwit the alluring young King.